The statistic presents the leading paid game titles on Steam in 2017, ranked by the estimated number of units sold. According to the calculations, CS:GO ranked second on the platform, with an estimated 12.54 million units sold in the measured period. PUBG topped the ranking with a 27.8 million result. On a global scale, League of Legends was the best selling game based on revenue in 2015. In the 80s and early 90s, the PC platform was credited with pioneering game genres, but since the introduction of game consoles and platforms on smaller devices such as smartphones, the PC market appeared to have been left in the backseat. In the era of mobile gaming, video game market revenue nonetheless shows that PC games remain a strong player in the industry, next to console and smartphone games. With the emerging popularity of e-sports and Steam, a combination of social network and online game store on PC that offer discounts and sales, PC games are poised to overtake those for video game consoles. By 2018, PC/MMO games are projected to contribute the biggest share of games market revenue worldwide, with almost 35 billion U.S. dollars in revenue. Revenue generated by game sales on Steam in 2015 was estimated to be worth 3.5 billion U.S. dollars. In the last month of that year, Steam sold more than 60 million copies of games in total. 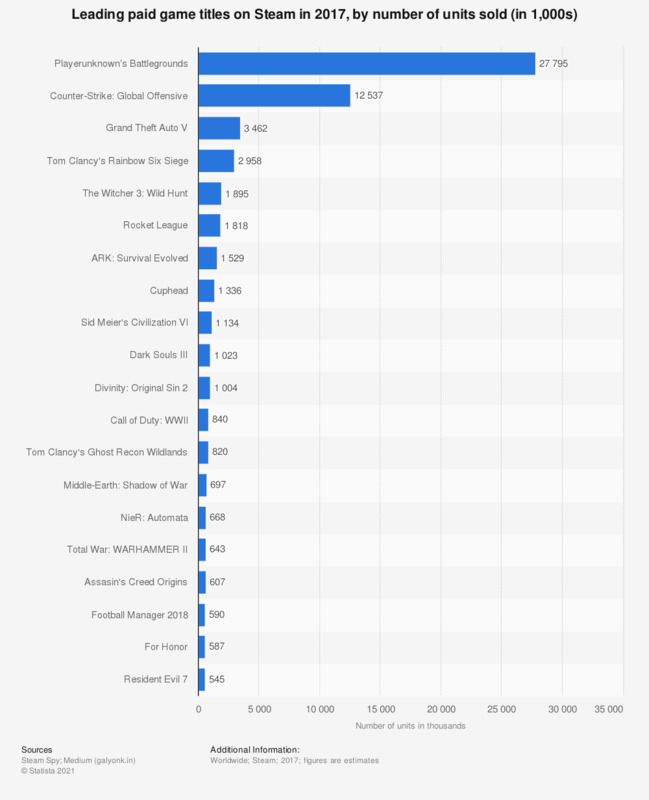 Of which, about 15 percent came from the sales of Grand Theft Auto V (GTA V), as of December 2015. With 3.8 million units sold, GTA V left Fallout 4 in a healthy distant second place. The leading position in this ranking, however, should not come as a surprise as the Rockstar-released game was reported to have generated 1 billion U.S. dollars in revenue within the first week after launch. GTA V remained the game with most sales revenue generated within opening week worldwide as of 2016. Among the top Steam titles, Fallout 4 was ranked second in terms of number of units sold, despite being the most anticipated PC video game in 2015, according to Nielsen. The game also claimed the second spot on the list of sales revenue generated within opening week, with 750 million U.S. dollar revenue received. ARK: Survival Evolved, which did not made either ranking table, unexpectedly came in third position in number of units sold. Other top-sellers trailing include the Rocket League, H1Z1 and Cities: Skylines.